I am struck by the wisdom and depth of this novel. The characters may be fictional, but they are real. Through using universal point of view, Tsalaky shows us the bone and viscera of their feelings. Take DC-1128, for example. She hates her job. Every day she must witness the deaths of those who have reached their fiftieth year. Once dead, their bodies will be recycled for the good of her society. Her society, however, may have material goods, but it suffers dullness and a poverty of spirit. DC-1128 lives in an artificial world because the outside is reputed to be incapable of supporting life, having been ruined through greed and war. Is it true? She doesn't know. Nevertheless she and her friends want something more, and they will fight for it. As a first step toward rebellion, DC escapes with one of the 50-year-olds to the outside, where they are surprised to find a thriving natural world with a happy and intelligent populace. There, individuals practice sustainability and seek psychic development and fulfillment, important ingredients in this tale. Tsalaky takes us into a plausible future that is both frightening and inspiring. The story is prophetic, for we see the struggle in our world between self-destruction and sustainability. What future will we choose?Several individuals share the spotlight, but at the story's end, when they find their peace, the spotlight shifts through an open door onto those whose futures are unresolved, and we will follow them in a sequel. Questions accompany us through that open door, which we hope will be answered in the next book. Will Ari surrender to death? How will Gemini, Finn, and Orion survive? Will blue stones play a role in the story? What will be the effect of a broken treaty? Tense, at times scary, the story grabs you and doesn't let go. As I read THE TRANSITION WITNESS, I found myself thinking: This is a well-written novel with an interesting premise and decent characters, and yet something seems to be missing.As I read further, it grew increasingly clear what that missing element was: what I was reading was more of a description of a story than the story itself. It struck me as ironic that author Teresa Tsalaky has her characters speak at length about the life force that binds us all together, and yet she has, in my opinion, failed to breathe the force of life into her novel itself.To me, the greatest strength of the novel was the passion of the author herself, but in my view – once again - that passion did not manifest itself in the characters and events, which were depicted in what to me was a disconcertingly detached way – as through a glass dully, if you will.As a non-fiction book on spirituality, I might judge the results differently, because there is a lot to like in it. But this is a novel, and its prime directive is to tell a story, not describe a philosophy. If the author cannot find a way to breathe *fire* into her characters and their lives, then I fear for the fate of her series. I suspect she has the fire within herself; she just has to find a way to release it. I read The Transition Witness a couple of weeks ago, and I'm only finally getting around to reviewing it because it has been stewing in my head. I think it's a hallmark of a good book when you're still thinking about it days or weeks later. The Transition Witness tells the story of a dystopian world where everyone's death date is determined by the government, and people live in massive structures, cut off from the natural world. The book introduces us to DC-1128, who has hatched a plan with others to get out of the closed-off city and into the natural world. This book certainly has action scenes, but ultimately, this book is about existence and all of the questions that can be asked along the way. Some reviews refers to this as having a spiritual element, and although I guess you could qualify it as that, I think the term metaphysical is more appropriate. The metaphysical elements fit in nicely with the story and didn't seem hokey or out of place.I enjoyed the main characters, DC-1128 (big props for a smart and sensible female protagonist) and Darby Tate, and thought they were well-formed, but I thought she could have explored more with Director Wolfe and other secondary characters. I thought Ms. Tsalaky did an excellent job at world-building - she really sets up an intriguing setting for this novel. It's a dynamic world, and I'm looking forward to her exploring it in further books. Like a modern day bard of old, Ms Tsalaky spins a yarn so well that it leaves you dizzy and questioning your own existence in its aftermath. Helplessly ensnared we are instantly transported to a world so like our own that you are secretly hoping it is truly different. As a captive audience to her whims we embark on a tale filled with numerous unpredictable twists and turns. This tale of human discovery will take you on a journey that feels as alive as the environment that surrounds you. Bear witness to the struggles that are born from within and manifest along their journey to personal freedom. Would you rather live in a beautiful dream or wake up and face an uncertain future of freedom? Are you strong enough to fight for your truth?This novel is set in a future that could very easily be our own. The authors style of writing is unique and you either like it or you don't. I am looking forward to seeing what happens in her future installments. Really? I'm supposed to review my own book? OK, I'm somewhat comfortable doing that, because I didn't really write it. To find out how it was written, you'll have to read my first blog entry.Meanwhile, I can tell you that although it's not Sometimes a Great Notion or The Source, for genre fiction, it's as good as any contemporary book on the market today.Although set in a dystopian future, the science fiction elements are simply there as the setting in which the characters can journey toward their redemptions. It's really an action-adventure with a female protagonist whom you'll come to love.I hope it entertains you, and I hope it moves you deeply. I hope it makes you think and laugh and cuss and cry, for those were my reactions as I watched it being written. May it open your heart and touch your soul. The beginning of this tale hooked me, if for no other reason than I wanted to know who DC-1128 was and why she didn't use a conventional name. I stayed intrigued as I journeyed with DC-1128 and Darby through their escape. Teresa Tsalaky did a decent job of creating and unfolding a future civilization different from what we are used to seeing in contemporary Sci Fi. Using vivid narrative, creative prose and multidimensional characters, Tsalaky tells a story of hope, discovery and change.The characters grew on me as I continued to read, as should be the case. Tsalaky even managed to turn a river into a character. I was intrigued as I watched the changes in their situations and internal struggles. I am curious to see how Gemini ends up.My chief issues were the occasional mixing of POV which caused me some confusion at times. The other was that while her ability to write brilliant prose is a fantastic talent, there where times when the prose slowed the story. I found myself skipping through certain areas to get back to the action. Lastly, I found that there was something missing from this story and after a while, I felt that it was passion. Maybe I was expecting something which the author wasn't intending. There seemed to be a lot of her philosophy heavily woven throughout. While I do understand that authors include their own ideologies, I did think it was a bit overdone here. I am interested in reading the 2nd installment in this trilogy. 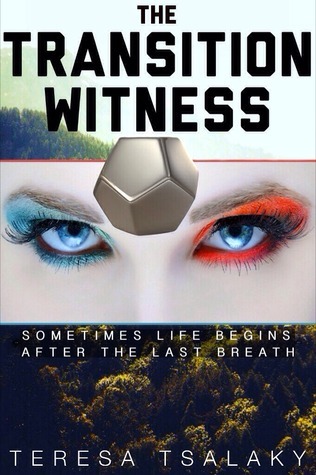 The Transition Witness by Teresa Tsalaky: This Dystopian SciFi takes you down the rabbit hole into a future where the populous are in cities living under domes called dodecahedrons. An unlikely hero goes about her day as a Transition Witness, (She watches others die.) until that one special person, that special spark. Now, DC-1128 and the man who had the spark, Darby Tate, begin their adventure into the wilds of outside the dome into the unknown. How will they fare? Will they find what they are searching for? I liked this book. I’d say within the first quarter of the book I was just barely on the fence and was of the mind to dislike it. But then the action happened and I was hooked. Initially the relationship between DC and Darby felt forced and not very natural. But as time went on and you saw them interacting with others, you find that you like where they are. All the characters were great, and written very well. You find out about their past and how it shaped their present and see what happens to them to mold their futures. I’d say the characters of Gemi and Director Wolfe change the most… some for good, some for bad. And that leaves a great question for future books. What does the future hold for Gemi (future Senator? ), former Director Wolfe, DC and Darby, and all the villagers? Although the beginning lagged a bit for me, the ending was a knock-out. This one is a classic dystopian SciFi story which is probably my favorite genre (at least at the moment). It deals with a heroine who escapes a technological, oligarchical society encased in a dome and encounters a very different, more natural lifestyle on the outside. I enjoyed the story as a whole a lot and particularly liked all aspects of the domed society. There is also a strong element of spirituality which was not my favorite part of the tale, but it added an original twist to the story. It is well written and quite captivating, but sometimes the writing felt a bit stiff or solemn. It seemed charming to me, but also tended to create a bit of emotional distance. I liked the diversity of the characters and I'm curious about what will happen to them in the next part of the series. For me, it could have gone into more depth regarding characterization and world building as I found both truly interesting and would have liked to learn more. All in all, a solid 3.5 rating for me. With elements of action thriller and fantasy adventure, this science fiction new release will sweep you along with it like a raging river and deposit you into an ocean of wonder.The language is lyrical and flowing, carrying you forward with it like being caught in a current. And the story itself has a cadence to it, moving back and forth between fast, chair-gripping action and the slower pace of the introspection of the characters.It provides a wonderful glimpse behind the veil of death. And the paranormal aspect is treated beautifully, with telekinetics, seers, manifesters and weather-wooers who are spiritually advanced but still human. For those of you with a metaphysical or spiritual bent, you know that good fiction that both entertains you and feeds your soul is hard to find. Not anymore. I can only hope that this author keeps writing. An inspirational spiritual message within a rousing science fiction adventure!After a worldwide revolution, politicians begin controlling even the deaths of the residents of the dodecahedron - the large sphere they all live inside of - so a "transition witness" is needed to make sure people die at the correct time and place according to the authorities who control and monitor all social resources.When the main character, DC 1128 – the "transition witness" - decides to take a dying man with her outside the sphere she discovers, to her amazement, that there are happy and healthy humans living successfully outside the dodecahedron.This story offers a possible solution to human wars, waste, pollution and, ultimately, success. I enjoyed the ideas and positive, spiritual point of view so would give it a thumbs up (five thumbs if I had them)! “The Transition Witness” was a very interesting read, blending commentary on human history and the possible (probable?) human future. The reader is thrown into a world that is post-Apocalyptic with a Big Brother government exercising total control over their sheltered communities. However, inside what is a very fast-paced, attention-gripping story, you will find lessons. The lessons are indictments of our past transgressions as a society, leading up to an annihilating world war, as well as indictments of our tendencies as humans to trade freedom for security. Overall, I found the book to be very thought-provoking, as well as a very entertaining look into a possible future that could...and should...be avoided. It’s been a long time since a novel, especially genre fiction, has made me stop and think – really think deeply about things that matter. And feel! I could actually feel my heart beating fast during the first escape. And when Darby was a jerk, I wanted to jump right into the book and give him a good thumping. When I cried at the end, it was tears of both joy and sorrow – sorrow for what DC had lost, and joy for what she had become. After the last page, I sat in my chair with eyes closed for half an hour, wanting to stay in that world for just a bit longer.If your not a science fiction fan, this book might make you reconsider the genre. In general, I'm so over the dystopian genre. Good writing and new ideas seem lacking - but I gave this book a try. I'm. so glad I did. Original ideas, complex characters, nonformulaic dialogue... this book is really good! I was reminded of great classic sci-fi. Sturgeon, Heinlein, Zelazny energy where the relationships and human spirit are the stars and the technology and broken world are just the stage. A complex beautifully crafted stage. Teresa Tsalaky - Thank God for Mrs. Hibbard. She wrote my poem out in big letters on a one-foot-by-two-foot card and tacked it up on the blackboard with a big gold star. And thus, a poet was born in the first grade.But who can make a living on that? Common sense sidetracked me into the world of journalism, which was great for my ego, because I won dozens of writing and editing awards and ended up as the head honcho of a daily newspaper on the California coast. When you’re a newspaper publisher, everyone wants you on their boards and committees, because they think that will get them better media coverage (wrong), but that illusion allowed me to add a lot of directorships to my resume.A perfect life, some would say, but I could never quench the deep yearning to use words creatively – not just to inform, but to inspire, to entertain, to move you. That yearning finally had to be satisfied, and so my first novel, The Transition Witness, comes out on Kindle June 15 (print edition to follow).Now that I’ve given its characters life, one of them, Gemini, keeps screaming out for her story to be told. So I suppose a sequel must be written, and quickly, before readers forget about her.So please stay tuned. And meanwhile, I’d love to hear from you. You can e-mail me at [email protected], or tweet me at @ttsalaky. Let me know if you want to be notified when the next book in the series comes out.